Two German backpackers ignored police advice and bedded down on a footpath in the middle of New Plymouth's CBD for the night to save money. 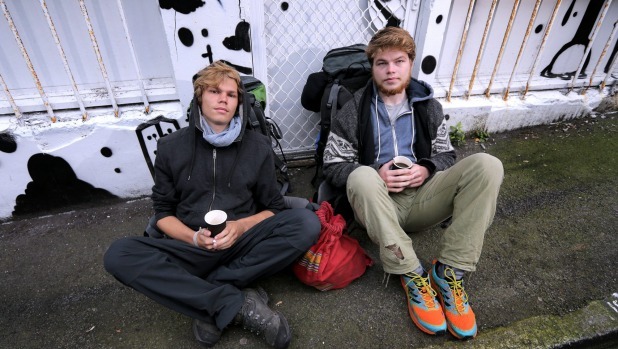 Joscha Kuehn, 20, and Eike Buckup, 20, hitchhiked to New Plymouth from Wellington on Monday and spent the night bundled up in their bright red and green sleeping bags outside a Westpac branch on Currie St.
Senior Sergeant Thomas McIntyre said it had been risky to leave themselves out in open while they were asleep. "It's probably not the best thing to do," he said. "You're opening yourself up." Taranaki's Fairfax media sales director Jamie Cameron said he almost tripped over the pair on his way to get a coffee on Tuesday morning. 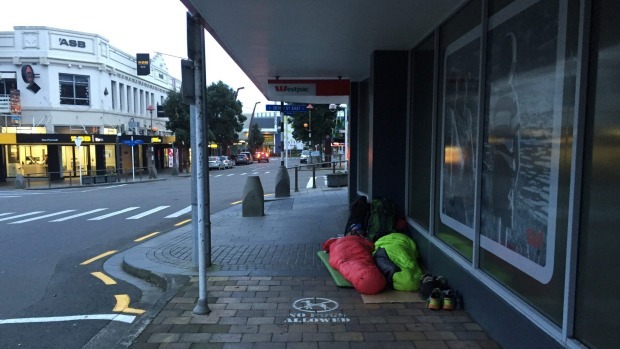 "It's something I have never seen in New Plymouth on the main street," he said. "They were fast asleep and looked like they had had a big night." He said it seemed strange that they had plonked themselves down in the middle of the footpath, rather than tucking themselves in a doorway or finding some other more picturesque area. "There are great parks around here and plenty of other places they could have gone for a beautiful sleep," he said. Kuehn and Buckup said they were sleeping on the street to save money after losing most of theirs during a three month holiday in India. While they still had some money left, they had decided to spend it on food, a beer every couple of nights and experiences, instead of accommodation. "We see it as an experience," Buckup said. "It's a different perspective and you somehow learn to appreciate what you got back home." The pair said police had advised them their choice of sleeping area was not illegal but was most certainly "not a good idea." As well as their sleeping bags, Kuehn had a small inflatable sleeping mat while Buckup was sleeping on a piece of cardboard he had found. "It somehow keeps the cold out but it doesn't make you lay comfortably," he said. "Just eating enough, having a beer now and again and going to the cinema is better than not having these things and sleeping somewhere for fifty bucks." They were planning on staying in New Plymouth for a day or two, before making their way up to Auckland from where they were flying back to Europe on June 27. The 20-year-olds said the decision to come to New Zealand was spontaneous after they grew tired of the heat in India. "We didn't even know it was winter here," Kuehn said. They hit misfortune in Delhi the day before they were due to fly to New Zealand, when Buckup had his passport, credit card and money and other documents stolen from his backpack at a hotel room. This meant he had to fork out cash to re-book his flight and order an emergency passport. They had also lost money on a motorcycle they had bought in India but had difficulty selling after they found out it hadn't come with the correct paperwork. As well as that Kuehn also had $800 stolen from his credit card after someone used it to buy a game console online. Kuehn said they were enjoying hitchhiking around the county. "It's guaranteed that you will meet cool people cause only cool people will pick you up," Kuehn said. "You get a really good insight into how Kiwis are." Do you agree with the tourists' decision to save money by sleeping on the street? Support your opinion by describing potential consequences of their actions. No as you could have been killed or got hypothermia, and had all of your money taken of made some one hurt like Jamie Cameron as he almost tripped over the pair on his way to get a coffee. Yes I agree that they will save money on the streets and probably even earn some money from people but the consequences that could happen are getting their belongings stolen, attacked by people, abused, etc. It is a way to save money but it is not very safe because they could have had their things stolen or they could have been attacked.It would have been better if they chose a less public place or stayed in a cheap hotel. I agree with the tourists desicion sleeping on the sidewalk was a smart way to save money but they should have thought about sleeping in a ten in a less public space. Well done Rimurimu, I like how you have included some alternative suggestions and examples. When using examples, avoid ending with "etc." If the examples are important enough to include, include them in detail! Otherwise, leave 'etc.' out. Should news articles always mention the nationality of people involved? What might be some of the negative consequences of this common practice? Yes because then the people that want to know about them (police) can know but the consequences are they can get abused, a person that knows where they live (in another country) could rob their house, etc. people over the world or in that area could steal something while they are gone so that person would have watched the news and heard that they are staying on the road and then the person could go to the area and find something that belongs to them and steal it. when the people get back it will not be there like for example there sleeping bags! they could have been robbed or attacked. Good job carefully reading the question Max and Ruby. You have both thought flexibly to generate some possible consequences. One of the consequences I had in mind was that this might encourage stereotypes about particular nationalities. What do you think? Identify and describe two habits of mind the tourists might have used to make their decision to sleep on the street. stop and think: to think is this the right thing to do. Thinking about thinking: what is a way we can save money. Identify and describe one habit of mind the tourists might NOT have used when making their decision to sleep on the street. Stop and think because they might not have thought about people thinking their poor so they might bully them and they could also get germs from being so close to the street. Good detail to support your answer, Oliver. Consider where you might like to travel and what experiences you might have. Describe your ideal travel experience. I think its a good way to save money but if i was them and i got a choice i would choose to sleep in a hotel not sleep on the side of a path in public eye. I think it is fine that that they were saving money by sleeping on the street though personally i wouldn't. Oops, both of you have clicked 'reply' under the wrong question. Your answers don't match this question about where you would like to go and your ideal travel experience. I love how you've used the 'questions' habit of mind to illustrate your ideas Julia. Well done.